The historical and physical findings that suggest the possibility of secondary hypertension are a history of known renal disease, abdominal masses, anemia, and urochrome pigmentation. A history of sweating, labile hypertension, and palpitations suggests the diagnosis of pheochromocytoma. A history of cold or heat tolerance, sweating, lack of energy, and bradycardia or tachycardia may indicate hypothyroidism or hyperthyroidism. A history of obstructive sleep apnea may be noted. A history of weakness suggests hyperaldosteronism. Kidney stones raise the possibility of hyperparathyroidism. An accurate measurement of blood pressure is the key to diagnosis. Several determinations should be made over a period of several weeks. At any given visit, an average of 3 blood pressure readings taken 2 minutes apart using a mercury manometer is preferable. [3, 5] On the first visit, blood pressure should be checked in both arms and in one leg to avoid missing the diagnosis of coarctation of aorta or subclavian artery stenosis. The patient should rest quietly for at least 5 minutes before the measurement. Blood pressure should be measured in both the supine and sitting positions, auscultating with the bell of the stethoscope. As the improper cuff size may influence blood pressure measurement, a wider cuff is preferable, particularly if the patient’s arm circumference exceeds 30 cm. Although somewhat controversial, the common practice is to document phase V (a disappearance of all sounds) of Korotkoff sounds as the diastolic pressure. Ambulatory or home blood pressure monitoring provides a more accurate prediction of cardiovascular risk than do office blood pressure readings. "Nondipping" is the loss of the usual physiologic nocturnal drop in blood pressure and is associated with an increased cardiovascular risk. A study by Wong and Mitchell indicated that independent of other risk factors, the presence of certain signs of hypertensive retinopathy (eg, retinal hemorrhages, microaneurysms, cotton-wool spots) is associated with an increased cardiovascular risk (eg, stroke, stroke mortality). Consequently, perform a funduscopic eye evaluation to identify any signs of early or late, chronic or acute hypertensive retinopathy, such as arteriovenous nicking or vessel wall changes (eg, copper/silver wiring, hard exudates, flame-shaped hemorrhages, papilledema). Acute or chronic ocular changes can be the initial finding in asymptomatic patients that requires a primary care referral. Alternatively, a symptomatic patient may be referred to the ophthalmologist for visual changes due to hypertensive changes. Palpation of all peripheral pulses should be performed. Absent, weak, or delayed femoral pulses suggests coarctation of the aorta or severe peripheral vascular disease. In addition, examine the neck for carotid bruits, distended veins, or enlarged thyroid gland. [3, 5] Listen for renal artery bruit over the upper abdomen; the presence of a bruit with both a systolic and diastolic component suggests renal artery stenosis. A careful cardiac examination is performed to evaluate signs of LVH. These include displacement of apex, a sustained and enlarged apical impulse, and the presence of an S4. Occasionally, a tambour S2 is heard with aortic root dilatation. Blood pressure is a powerful determinant of risk for ischemic stroke and intracranial hemorrhage; in fact, long-standing hypertension may manifest as hemorrhagic and atheroembolic stroke or encephalopathy. Both the high systolic and diastolic pressures are harmful; a diastolic pressure of more than 100 mm Hg and a systolic pressure of more than 160 mm Hg are associated with a significant incidence of strokes. The American Heart Association notes that individuals whose blood pressure level is lower than 120/80 mm Hg have about 50% the lifetime stroke risk of that of hypertensive individuals. 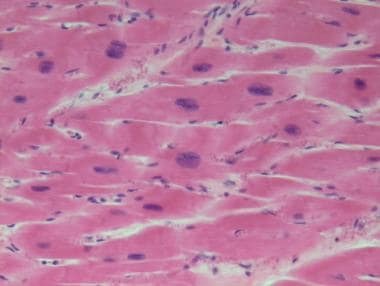 The main pathologic findings are in the heart, which shows an increase in mass caused principally by left ventricular hypertrophy. Histologically, the individual myocytes are enlarged and show nucleomegaly (“box car” nuclei) (see the image below). Hearts that are enlarged secondary to hypertension have an increased incidence of arrhythmia and death. Other cerebrovascular manifestations of complicated hypertension include hypertensive hemorrhage, hypertensive encephalopathy, lacunar-type infarctions, and dementia. Hypertensive encephalopathy is one of the clinical manifestations of cerebral edema and microhemorrhages seen with dysfunction of cerebral autoregulation and is characterized by hypertension, altered mentation, and papilledema. The history and physical examination determine the nature, severity, and management of the hypertensive event. The history should focus on the presence of end-organ dysfunction, the circumstances surrounding the hypertension, and any identifiable etiology. The physical examination should assess whether end-organ dysfunction is present (eg, neurologic, cardiovascular). BP should be measured in both the supine position and the standing position (assess volume depletion). BP should also be measured in both arms (a significant difference may suggest aortic dissection). Uncontrolled and prolonged BP elevation can lead to a variety of changes in the myocardial structure, coronary vasculature, and conduction system of the heart. These changes in turn can lead to the development of left ventricular hypertrophy (LVH), coronary artery disease, various conduction system diseases, and systolic and diastolic dysfunction of the myocardium, which manifest clinically as angina or myocardial infarction, cardiac arrhythmias (especially atrial fibrillation), and congestive heart failure (CHF). Thus, hypertensive heart disease is a term applied generally to heart diseases—such as LVH, coronary artery disease, cardiac arrhythmias, and CHF—that are caused by direct or indirect effects of elevated BP. Although these diseases generally develop in response to chronically elevated BP, marked and acute elevation of BP can also lead to accentuation of an underlying predisposition to any of the symptoms traditionally associated with chronic hypertension. Advances in the ability to identify, evaluate, and care for infants with hypertension, coupled with advances in the practice of neonatology in general, have led to an increased awareness of hypertension in modern neonatal ICUs (NICUs) since its first description in the 1970s. The true incidence of hypertension in the pediatric population is not known, although various health data showed a decreasing trend between 1963 and 1988, followed by an upward trend. Hypertension is now commonly discovered in children, and the long-term health risks to these children may be substantial. Systemic hypertension is less common in children than in adults, but the incidence of hypertension in children is approximately 1-5%. The presence of hypertension in younger children is usually indicative of an underlying disease process (secondary hypertension). In children, approximately 5-25% of cases of secondary hypertension are attributed to renovascular disease. Mineralocorticoid excess secondary to primary hyperaldosteronism is characterized by excessive production of aldosterone. Previously considered a rare cause of hypertension, PA is now recognized to be the most common cause of secondary hypertension. Renal sodium retention, kaliuresis, hypokalemia, and hypochloremic metabolic alkalosis are the common manifestations. It should be considered in patients who have an exaggerated hypokalemic response to a thiazide diuretic or who have hypokalemia unprovoked by a diuretic. These patients develop increased intravascular volume, resulting in hypertension. Hypokalemia, however, is present in less than half of patients with PA, and thus the ratio of plasma aldosterone to renin activity should be used for screening of suspected cases. Blood pressure increase may vary from mild hypertension to marked elevation in primary hyperaldosteronism. Patients may have underlying adenoma or hyperplasia of the adrenal gland and rarely have an extra-adrenal source for aldosterone. The incidence of primary hyperaldosteronism was 1.5% in one study. However, the true incidence of primary aldosteronism has been estimated to be as high as 5-15% and is often associated with metabolic syndrome. Related to this, obesity is increasingly associated with PA and treatment with aldosterone receptor antagonists have proven effective in this population.